A preface: one of the biggest problems with this blog was the fact that I fell into the "trap" that each blog post has to be a giant webpage-esque feature that was well worth the weeks I spent on it. Things like the Northgate post, the MSC post, and the Post Oak Mall post: those were all huge efforts. Unfortunately, they took way too long to compile, and updates were a huge pain to do. As a result, they get dated quickly, and updates pile up. In fact, I remember combining several POM posts into the Post Oak Mall post (done December 2011), and now I'm actually considering breaking it back up again. To combat that, there was a change of the way things were done around the blog. This was one of those first posts that had the new format. 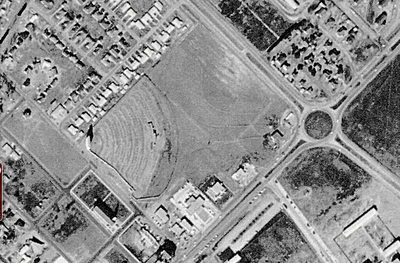 The Circle Drive-In of College Station, Texas, located on the corner of modern-day College Avenue and University Drive. Still whispered about on the Internet and unrelated to the Circle Drive-In in Waco, mostly intact but now a flea market, the Circle Drive-In was so named because (like its unrelated Waco cousin) a traffic circle was nearby (which is now gone). 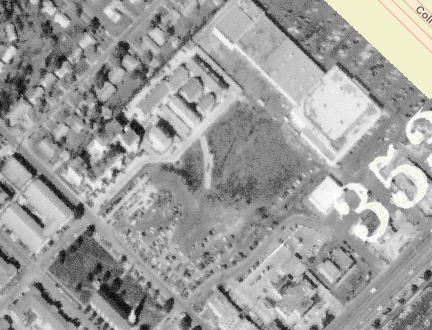 Anyway, it disappeared between 1979 and 1983 (probably closed soon after the time Skaggs Shopping Center came into existence, which had a movie theater of its own) and was quickly forgotten. 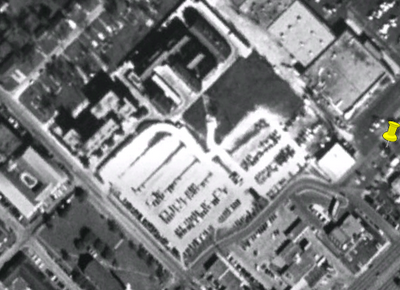 Two apartment complexes, Newport Condominiums and North Ramparts Apartments were up by the end of the 1980s and the rest became the "Mud Lot", a cheap dirt parking lot owned by St. Mary's, which disappeared in the late 1990s or early 2000s when half of it was converted to parking. Whether you're parking at St. Mary's, exploring the ruins of Newport, living at North Ramparts, or (soon) The Stack: just remember: you're on the grounds of an old movie theater. 5/22/13 Update: Added information on the demo of Newport, changed to past tense on describing the post. 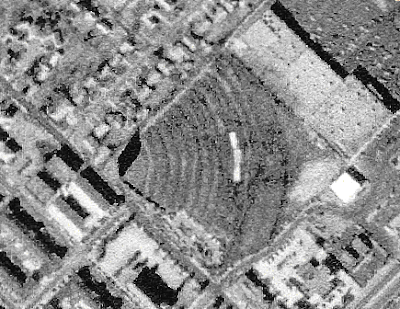 A much, much, better version of this 1989 shot is found here. This version is from TexasEscapes. 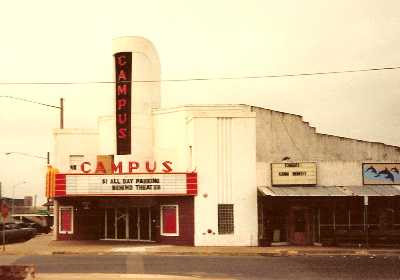 The Campus Theater opened in Northgate in 1940, on the corner of Boyett and University. It was the first theater in College Station, and ended up lasting a very long time. Done in an art deco style and with a single screen (it had a balcony and cry room, too! ), it survived sometime into the mid to late 1980s as competition forced it out of business (or maybe the Schulmans, which owned and built it, closed it in '85, along with their theaters in downtown Bryan. Makes sense in the timeline). (Here is an awesome shot of the cinema not too long after opening, but I don't have permission to post it). After the theater began to deteriorate, around 1995 it finally reopened as Shadow Canyon, which soon after gave it a dreadful makeover by covering over much of the building in wood to give it a country-western theme, and that's been the type of tenant of it's been ever since. Shadow Canyon did well initially, but within a decade, they were out, after they started charging a cover and used gimmicks like wet t-shirt contests to gain attendance. Next up was Midnight Rodeo, which still has locations in San Antonio and Amarillo (an Austin location has closed since 2013). But the College Station location did not last nearly as long as Shadow Canyon, as it opened in early 2006 and closed by summer 2007. (There was another location in Katy Mills in Katy that closed about the same time, and was replaced with Circuit City, bet that went well for them). 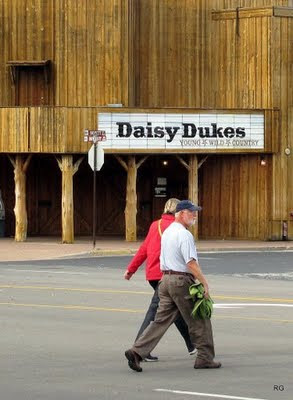 In 2008 (at least I think it was 2008), it became Daisy Dukes, owned by the Dallis brothers, which was a country-western dance hall. As you can see from a Panaramio picture below, it's obviously the same building, but horrible things have been done to it (sorry I lack a better picture). So the building was clearly mauled, but it got worse. In spring 2013, Daisy Dukes took advantage of the upper level the original building had and opened rooftop seating right above the marquee, with seating and televisions. This was not only ugly but also raised the question if the circa 1940 roof clearly not designed to support tons of people would collapse one day (then again, these sorts of things were done with all sorts of redundancies). By November, it was renamed to Duke's, and by summer 2014 changed hands to The Tap's owners. Prior to this time, there was a lot of drama with the Dallis family including squatting in the Café Eccell building, DUI arrests, and the fact that a former manager of DD's (and an estranged brother, at least publicly) was arrested for something more major, and while initially The Tap talked about the space becoming "No Name Saloon" (which was just a temporary name and never actually on the marquee, the closest to that being when they were changing signs). Their Twitter page actually "borrowed" the same Campus Theater page I had linked to (and I am absolutely sure they saw this page), but not only did they not restore the facade (not that I expected them to do so at all but the opportunity was there) it just remained a trashy dance hall, this time named Boulevard 217. As a "parting shot", here's a from-the-back-seat picture I took of it on the night of October 30, 2014. Editor's Note: This post was rewritten in 2015, but at the end of 2015, Boulevard 217 closed, and was replaced with Shiner Park, which opened for the fall 2016 semester. * This was cited from a link from The Eagle (now dead), but the URL indicated it was the June 8 2007 issue, if that helps.